A kayaker in New Zealand has become a viral sensation after a seal slapped him the face with an octopus. A GoPro video camera captured the whole odd ordeal. 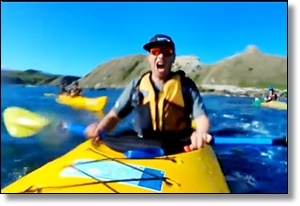 Kyle Mulinder was kayaking with friends off the coast of Kaikoura, New Zealand, when he felt the big wet slap in the face and realized it was an octopus that was whipped at him by a seal. "Out of nowhere, it literally rose from the depths, as it was mid-fight, thrashed it around, and the rest is history," Mulinder told Australia's Network 10 News. Video of the chance encounter was shared on social media and quickly went viral. Mulinder said he instantly got attention for the video, and was recognized while he was on his way to the Network 10 interview. "My Uber driver who just brought us here just goes 'you're the guy, you're the octopus guy'," Mulinder told Network 10.